Welcome to Frankfurt, you will be met and transferred to the ship in Mainz on the Rhine River. A warm welcome awaits from your captain and crew as your board your luxury Emerald Waterways river cruise ship. This evening, join your fellow travellers for dinner on board. Your Cruise Director will also conduct a port talk to review the activities and itinerary for the days ahead. Welcome to Switzerland and the Rhine–side town of Basel, the centre for Switzerland's pharmaceutical industry. After, your breakfast you will disembark your ship and transfer by coach to the lovely city of Lucerne. 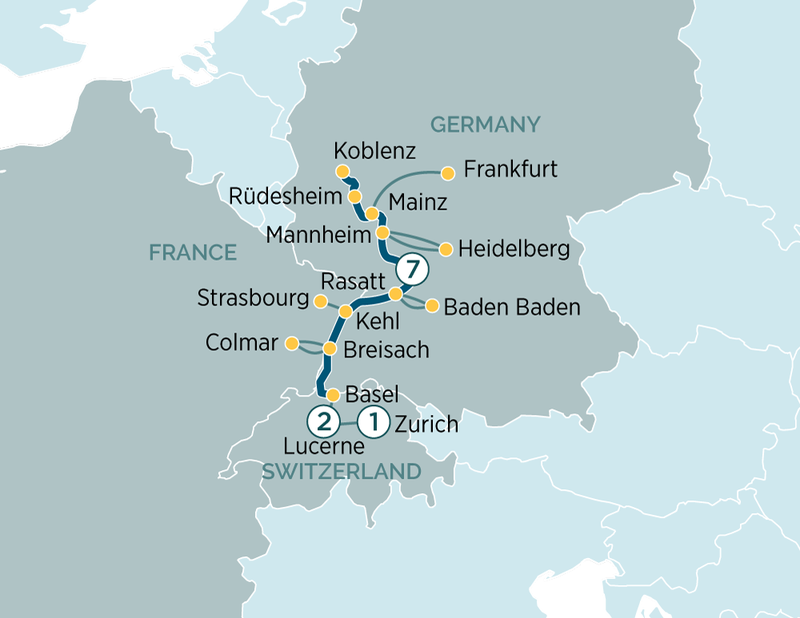 Included is a two-night stay in Lucerne. This morning starts with a guided tour where you will see the world-famous sights such as the Chapel Bridge with the octagonal Water Tower, the Jesuit Church and the KKL Luzern (Culture and Convention Centre Lucerne). On the tour you will learn important and humorous facts about the history of Lucerne and the everyday life of its residents. This morning transfer by coach from Lucerne to the cosmopolitan city of Zurich. The city is often called by the local’s as “Downtown Switzerland”, for its internationally renowned financial importance as a centre for banking. You have the day free to enjoy the delightful lakeside setting or stroll on the Bahnhofstrasse, and other main sights of Zurich. Included is a one-night stay in Zurich. After breakfast, it is time to farewell your fellow passengers and transfer to the airport.